This storywas updated at 6:31 p.m. EDT. NASA?s space shuttle Endeavour is officially set to blast off toward theInternational Space Station on June 13 to finish work on the $100 billionoutpost?s massive Japanese lab. Shuttlemission managers on Wednesday approved plans to launch Endeavour on a marathon stationconstruction flight at 7:17 a.m. EDT (1117 GMT) on June 13, nearly threeweeks after the successful return of its sister ship Atlantis from the HubbleSpace Telescope. ?We?regetting pretty darn close to kicking this mission off next Saturday,?Endeavour?s commander Mark Polansky told reporters today at the shuttle?slaunch pad in Cape Canaveral, Fla. ?We?re excited about the work we?re going todo.? Polansky?ssix-man, one-woman crew is poised to lift off from a seaside launch pad atNASA?s Kennedy Space Center to deliver a porch-like external platform for thespace station?s massive Japaneselaboratory Kibo, which means ?Hope? in English. ? The $1billion Kibo lab is the space station?s largest room, about the size of a tourbus, and currently sports an attic-like storage module, small airlock androbotic arm. The new platform will be attached to the lab?s exterior to exposeexperiments and materials to space for long duration studies. Five intricatespacewalks and complicated maneuvers with three different robotic arms areplanned during the 16-day mission, which will tie the record for the longeststation-bound mission to date. ?Thismission is unbelievably complex,? said Bill Gerstenmaier, NASA?s space operationschief, in a televised briefing late Wednesday. ?It?ll be a very challengingmission for the team.? Thespaceflight, NASA?s third shuttle mission of the year, is also the first tosend seven astronauts to the space station since the outpost doubled its permanentcrew size to six people last week. When Endeavour arrives, 13 people will liveand work aboard the station - the most ever aboard the orbitaloutpost. ?It?s justa really good mix of folks and I think we?re going to work well together as ateam,? said Endeavour astronaut Tim Kopra from the launch pad. Kopra willreplace Japanese astronaut Koichi Wakata as a member of the space station?ssix-man crew after Endeavour arrives. Wakata, who has lived aboard the stationsince March, is Japan?s first long-term resident of the orbital laboratory anddue to return home in late June aboard Endeavour. Endeavour?sSTS-127 astronaut crew will climb aboard the shuttle on Thursday for a launchdress rehearsal at the Kennedy Space Center. They will cap the launch simulationwith an emergencyescape drill before returning home to NASA?s Johnson Space Center inHouston. NASA has aslim three-day window in which to launch Endeavour to the station beforestanding down to allow an unmanned moon probe, the Lunar Reconnaissance Orbiterand the attached LCROSS impactor, to blast off on June 17 from the nearby CapeCanaveral Air Force Station. If the shuttle does not launch by June 15, itcould try again four of five days later, but only of the moon-bound mission liftsoff on time. If Endeavour is unable to fly in June, it would have to wait untilJuly 11 when sun angles at the space station are more favorable, missionmanagers said. Pete Nickolenko,launch director for Endeavour?s flight, said the schedule is tight, with noreserve days to deal with unexpected glitches. On Sunday, the shuttle moved toits current seaside Launch Pad 39A from the nearby Pad 39B, where it had beenon standby to fly a rescue mission for Atlantis? Hubble telescope service callin case of an emergency. While no spacerescue was required, the effort to prime Endeavour for flight streamlined thework required for its current mission to the station, said Nickolenko. 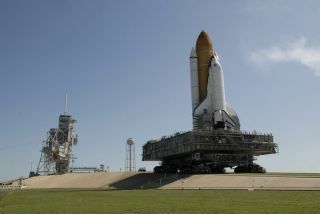 As longas the Florida weather cooperates, the shuttle should be ready for its June 13launch, he added. ?I think we?rerunning on all cylinders, in my mind ? we?re hitting our strides,? Nickolenkosaid. ?It?s all rapid-paced, but it?s all doable, manageable. The teams areseasoned, but I believe that they?re focused. ?